Richmond is home to 32 miles of shoreline, the most of any city in the San Francisco Bay Area, creating wonderful opportunities for shoreline parks and open space. Richmond south shoreline. Photo by Patricia Jones. The city of Richmond is working with the community to develop the area along the south Richmond shoreline. CESP is concerned about the long history of toxic contamination in this area. After several community workshops in 2013, a Draft Land Use Map was released in March 2014. In addition, the Transportation Connectivity Plan proposed new connections and street and network corridor improvements for the area. CESP is concerned about the sensitive coastal prairie at the project site and asked the City to take steps to protect the coastal prairie; specifically to not extend Lark Drive through this area. In May 2014, the Richmond City Council adopted a resolution to protect the coastal prairie at this site by removing any plan to route vehicle traffic through the prairie site and to direct staff to create alternative routes around the prairie site. Respect the community and the 2012 General Plan – reaffirm the open space designation between Bayview Ave., Hoffman Marsh and the shoreline. Do a full clean-up to residential standards of the contaminated area in the plan. The Richmond Southeast Shoreline Area Community Advisory Group (CAG) invites public participation at its monthly meetings, held at 6:30 pm on the 2nd Thursday each month at City Council Chambers, 440 Civic Center Plaza Basement. CESP encourages those concerned about the future of this environmentally endangered site to attend. August 2016: UC Berkeley suspended work on the Berkeley Global Campus at Richmond Bay due to budgetary constraints. The Zeneca/Campus Bay properties border a 3/4 mile east-west stretch of the Bay Trail north of Pt. Isabel and south of Richmond’s Marina Bay. Stauffer Chemical Company and later Zeneca Inc. manufactured hazardous chemicals at the site until 1997 when the facility was shut down. Zeneca failed to appropriately clean the site and the property remains one of the most toxic sites in the Bay Area. The adjacent University of California Richmond Field Station site also has confirmed metals, VOCs, PCBs, and pesticides in soil and groundwater. Protect the sensitive coastal prairie. Create a management plan to protect the coastal prairie prior to, during and after construction. 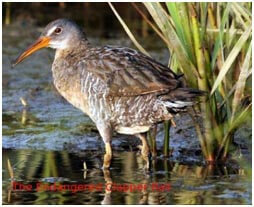 Address the significant impacts on all biological resources: wetlands, marshlands, creeks and wildlife. Address cumulative significant impacts of transportation and traffic on the coastal prairie and the SF Bay Trail. Do a full clean-up of the project parcels, as well as adjacent parcels which leach toxic substances into the project area. In addition to UC’s LRDP, a Draft Removal Action Work Plan was released by the California Department of Toxic Substances Control (DTSC). The plan evaluates clean-up alternatives to remaining pollution at the Richmond Field Station. CESP submitted a letter asking DTSC to do a full clean-up to residential guidelines. CESP supports open space and park use for the North Richmond Shoreline which contains some of the last pockets of pristine tidal land in the East Bay. The North Richmond shoreline, which stretches from Pt. Pinole to Wildcat Creek Marsh, contains 500 acres of tidal marshes and 800 acres of mudflats. Three creeks – Rheem, San Pablo, and Wildcat – empty into the San Pablo Bay at the shoreline. This unique ecosystem is home to many threatened and endangered species and millions of migrating birds every year. The largest eelgrass bed in the entire San Francisco Bay is just offshore; it is a breeding habitat for many species of invertebrates, waterfowl, and fish. Click here to download a PDF describing key North Richmond shoreline properties. CESP supports the creation of a Shoreline Scenic Protection Zone from the land on the bay side of the Richmond Parkway until it intersects the Union Pacific Railroad tracks. From there, the Scenic Protection Zone would be made up of the land west of the railroad tracks as far north as Point Pinole. See map. The creation of a parkland destination will enhance the image of Richmond, improve the quality of life and raise property values. CESP wants to restore community access to a protected shoreline, which will provide much-needed recreational opportunities to residents of adjacent neighborhoods. CESP would like to see the North Richmond Shoreline transformed into one of the outstanding jewels in the Bay’s necklace of shoreline parks. 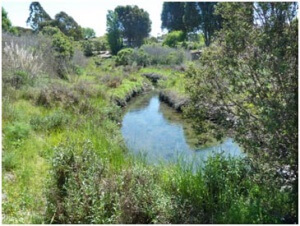 Click here to download a PDF of CESP’s vision for the North Richmond. Click here for more North Richmond shoreline history. Point Molate is a former U.S. Naval facility which closed in the 1990s located just north of the Richmond/San Rafael Bridge on the San Pablo Peninsula. The eastern half of Point San Pablo is owned by Chevron, which had been a supporter of open space on Point Molate. As part of closing the base, the Navy had to go through the BRAC process (Base Reuse and Closure) which required a clean-up of toxics and turning over the facility to the public in the area. In 2003, the Navy turned the property over to the city of Richmond. After many public meetings with the Blue Ribbon Committee the city adopted a plan for limited development of the old Winehouse Winery and associated buildings. However, in 2004 the City ignored the Blue Ribbon Committee plan and signed an agreement with a consortium to develop a Nevada- style casino at Point Molate. CESP filed a lawsuit against the City of Richmond citing its failure to conduct an Environmental Impact Report (EIR) prior to entering a binding agreement, a violation of the California Environmental Quality Act (CEQA).With the support of the East Bay Regional Park District and the State of California, CESP succeeded in blocking a binding agreement between the city of Richmond and developers without an EIR. In 2009, CESP, once again filed a lawsuit to block the plan backed by the Richmond City Council, to allow a corporation controlled by Berkeley developer James D. Levine, and two Native American tribes (the Guidiville Rancheria Band of Pomos, who would own the land as a reservation, and the Rumsey Band of Wintuns) to build and operate a casino at Pt. Molate. The lawsuit charged that the City and the Navy breached CEQA when they reached an early transfer agreement giving most of the site to the City, and again when the City and Upstream, Levine’s company, signed a remediation agreement in which Upstream agreed to pay for the remaining clean-up or containment of hazardous materials remaining from the naval operations. On October 19, 2010, CESP signed the Point Molate Shoreline Protection Agreement to settle the lawsuit CESP filed January 2009 challenging the Pt. Molate development. More than three-fourths of the 412- acre site was to be restored and protected in perpetuity. This agreement created much stronger protections than a courtroom victory would have because of the limitations of CEQA (environmental protection) lawsuits and the federal requirement of economic benefit from the closed Navy facility. Buildings were to be placed only in areas previously used by the Navy, avoid sensitive habitat areas, and be set back from the Bay to allow for a continuous shoreline and expanded Bay Trail. More than $48 million was made available for shoreland acquisition, habitat restoration, park creation, and recreational access, including $5 million for the Bay Trail. Click here for more information on the Point Molate Shoreline Protection Agreement. After the agreement was signed, a new Richmond City Council voted to end consideration of the Casino project. Pt. Molate Beach reopened to the public in October 2013 and a grand opening reception was held in April 2014. Click here for pictures from an open space study of Point Molate. Click here for an update on the Point Molate Lawsuit. Click here for an additional update on the Point Molate Lawsuit. Mr. Levine lost his lawsuit and has filed an appeal. He has proposed a settlement agreement to the city of Richmond, the terms of which have not been made public. The Richmond City Council is currently considering those terms, but have stated that the process to consider land use at Pt. Molate will be public. CESP continues to support open space and park use for Point Molate. The site should be protected and developed in accordance with the recommendations of the Reuse Plan of the Blue Ribbon Advisory Committee, as adopted by Richmond City Council in 1997. The Breuner property, the cornerstone of the North Richmond Shoreline, is one of the most important expanses of undeveloped shoreline in the Bay Area. It shows the Bay as it once was: an open saltwater marsh and coastal prairie, filled with wildlife. The endangered Saltmarsh Harvest Mouse and California Clapper Rail and many other species of flora and fauna call the Marsh home. 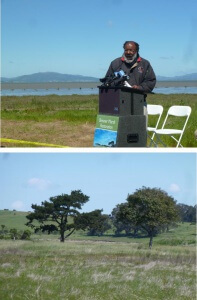 Earth Day 2014 marked the groundbreaking of the Breuner Marsh Restoration and Public Access Project, a part of the Point Pinole Regional Shoreline. The project will restore approximately 60 acres of wetlands and adds a 1.5-mile extension of the San Francisco Bay Trail. The groundbreaking is a milestone in the 20-year effort to protect Breuner Marsh as open space. CESP Executive Director, Patricia Jones, attended the event and captured the following images. Key project goals are to restore historic San Francisco Bay wetlands, close a key gap in the San Francisco Bay Trail, and develop other public access facilities. 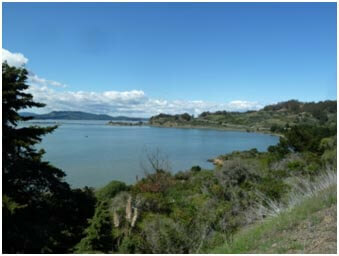 In October 2010, the East Bay Regional Park District began Phase I of a multi-phase project to build a second entrance area and other amenities at Point Pinole. 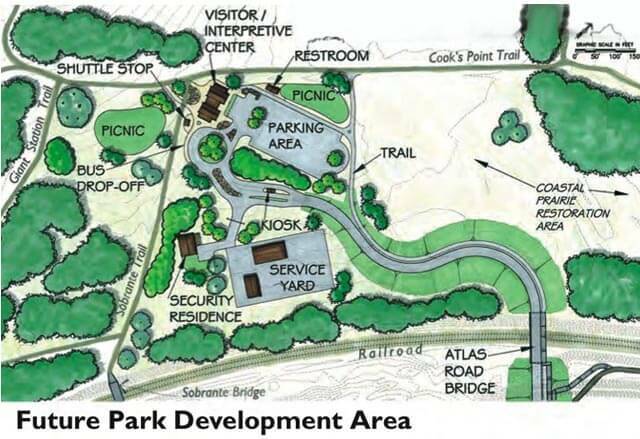 The new entrance will be near the center of the park’s eastern boundary at Atlas Road, providing better access and more recreation opportunities for visitors. The main portion of the Phase I project includes the Atlas Road Bridge over the railroad tracks, setting the stage for additional phases of park improvements such as a parking lot, picnic areas, and a future interpretive center in this new location. The bridge will serve as both a vehicle and ADA compliant pedestrian bridge, which also connects to the San Francisco Bay Trail. The project addresses the interests of local residents and, when all phases are complete, provides the access, programs, trails, and improvements envisioned by our larger community while protecting the natural values and features of the park. None of what CESP has done would have been possible without you. To continue our work to protect the priceless beauty and importance of our East Bay shoreline we need you more than ever. Ask to receive e-mail ACTION. You can personalize your request by designating specific areas of concern. Respond to those ALERTS by attending meetings and speaking up, writing letters or sending e-mails. If you write, please be sure and send a CC to CESP. Attend a regular CESP meeting, or a special presentation held from time to time. If you let us know you want to attend and what subject interests you, we will inform you of all the details. 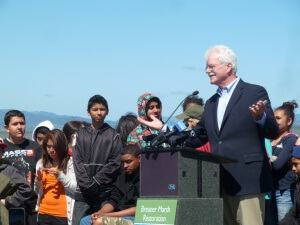 Together, we can, and will protect the Bay and save our shoreline for the generations to come.